Description: •No need to go outside for pedicure, Do at your home. •This callus remover tool is very easy to use works smoothly on feet to remove dead skin. •Long term answer for dead skin. 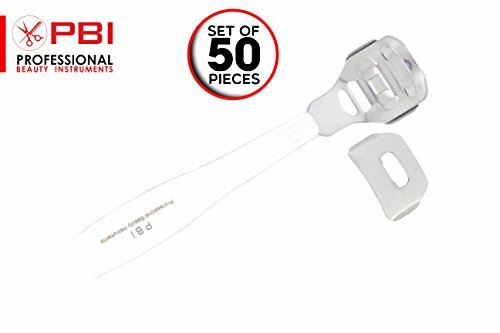 •Life time durability because of High quality plastic material •PBI professional beauty instruments believes on the long term relations with the customer • Satisfaction of customer is our stander . •wholesale and retail customers can get more information about new products from our official website www.pbigermany.de. •About our Services •PBI always prefer customers first, Our Customers Satisfaction and trust on us is the policy of PBI. •PBI Sell Instruments Beauty, Dental and Surgical Instruments according to Market stander and We always try to do our best to deliver Products to our valuable customers, But sometimes if there is technically something wrong with parcel delivering services or if you are not satisfied with our products please let us know and we will reply you within next 24 hours. •Pleas contact us first before you put negative feedback so in this case too we will reply within next 24 hours and we will try to do our best to satisfy you. •And if you are satisfied with our products and services please put your positive feedback because your precious words are valuable for us. If you have any questions about this product by PBI professional beauty instruments, contact us by completing and submitting the form below. If you are looking for a specif part number, please include it with your message.